November 22, 2013, 2:29 p.m.
London’s parks share a rich history and hold a special place in the hearts of many Londoners. Richmond Park and Hyde Park began as “deer parks” – hunting grounds for the British aristocracy, whilst St James’s Park has been at the centre of the country’s royal and ceremonial life for over 400 years. 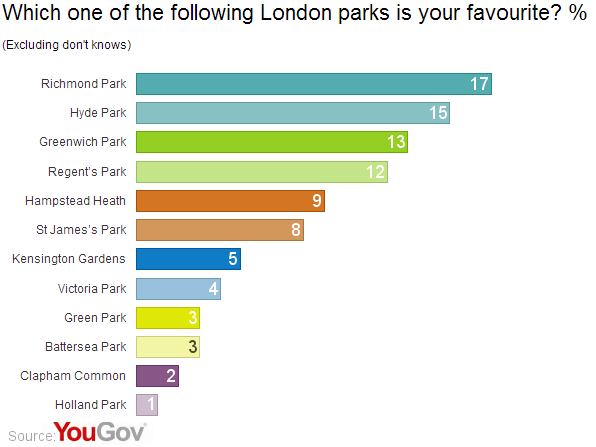 YouGov research shows a broad range of opinion on London’s favourite park – but Richmond Park and Hyde Park are out in front. Richmond Park tops the list, the favourite park of 17% of Londoners that gave an opinion (excluding 9% &apos;Don&apos;t know&apos; responses); this is closely followed by Hyde Park (15%). The eight Royal Parks dominate the list, with Hampstead Heath (8%) the highest ranking non-royal park. Amongst the top two parks, there is a generational divide in opinion. Hyde Park is the favourite park of 27% of Londoners aged 18-24 and just 7% of those over 55, whereas Richmond Park is the favourite amongst 23% of over 55s and 9% of 18-24 year olds. Winter Wonderland opens this evening at Hyde Park with rides, attractions and markets transforming the Central London park for six weeks of festivities.